LTC has reached 63 total visitors! The Twilight movie is coming out this December, and all of us here at LTC are ready to go and express our passionate dislike of it! Woohoo! I, for one, am going with Emy and Meirui, and we're ready to throw popcorn at the screen! I feel for the people who'll be watching with us. On a happier note, Breaking Dawn is coming out August 2nd!!!!!!!!!!!!!!!!! !1 I'm feeling a bit more optomistic about this, compared to the Twilight movie. LTC has had a load of visitors!!!!! Unfortunatly, some of them were me because I had some problems with my people counter thingy.... If you're coming here for the first time, I'M SORRY!!!!! I haven't worked out all the kinks yet, so just try to hang in there. The 2nd teaser trailer for the movie is out. I am sooo disappointed. It made me cry with it's patheticness. Well, I'm still going to see the movie, but I think that it will be an utter fiascio! Well, we only have to wait a few more days!!! That's right people, five more days!!!! Breaking Dawn is almost here, and I can't wait! The first chapter was amazing! 'I was with Edward in my happy place.' How brilliant! (brilliant is very englishy sounding...) If you don't know, there are Breaking Dawn 'quotes of the day' on Stephenie's site, so check it out!!! Have a brilliant day! Today, I finally have a pic of my trip to Forks!!! 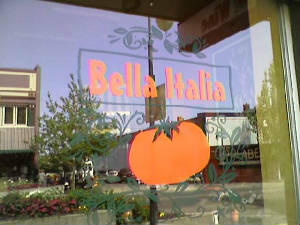 It's the sign on Bella Italia!!! Also today, my BFF and fellow Twilight lover Beatrice is going to visit!!!! We'll be going to a midnight release in Moscow, and it's going to be great!!! AND....My site is on stepheniemeyer.com!!!!!!!! How awesome is that!!!! Well, tonight is the night! ...Ahhhhhhhh!!!!!!!!!! We're so excited, our heads are going to pop!!!! We'll be leaving at 11:00, so we'll have time to finish our movie, then we're MIDNIGHT-RELEASEING!!!!!!!!! This is going to be so COOLIO!!! Have fun all! Well....I'm at Beatrice's house right now!! Woohoo. Spontaneous fun. I'm staying here, another 4 days, then heading home. Have fun reading!! "Love knows no reasons, love knows no lies. Love defies all reasons, love has no eyes. But love is not blind, love sees but doesn't mind." "Love is one song sung by two". The movie sucked. Yup. I went there. Here is the cover of the subject of my obsesivness...... Twilight!!!!! This site is run by teens who are afraid of lawyers and do not want to be sued. If we're doing anything illegal and you need us to change it, contact us and we'll fix it as soon as we can!